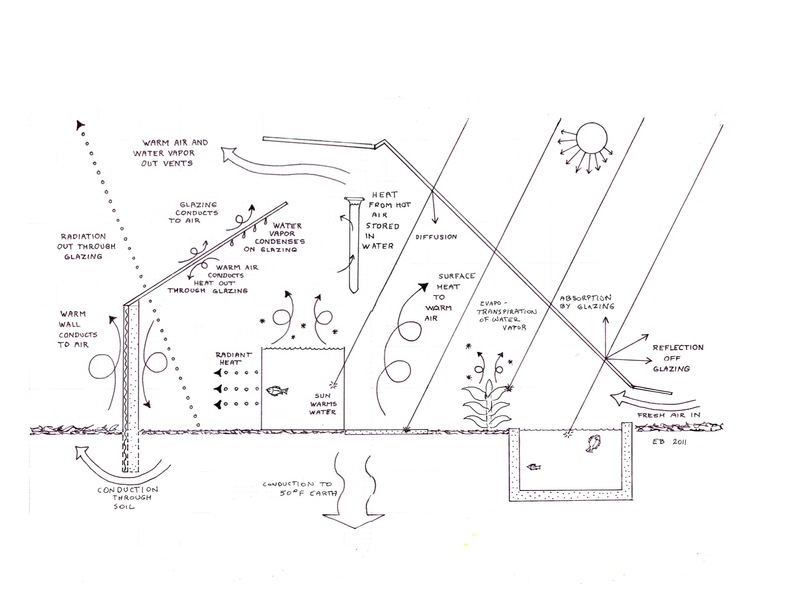 A bioshelter is a new, more complex form of greenhouse that can meet important basic human needs. 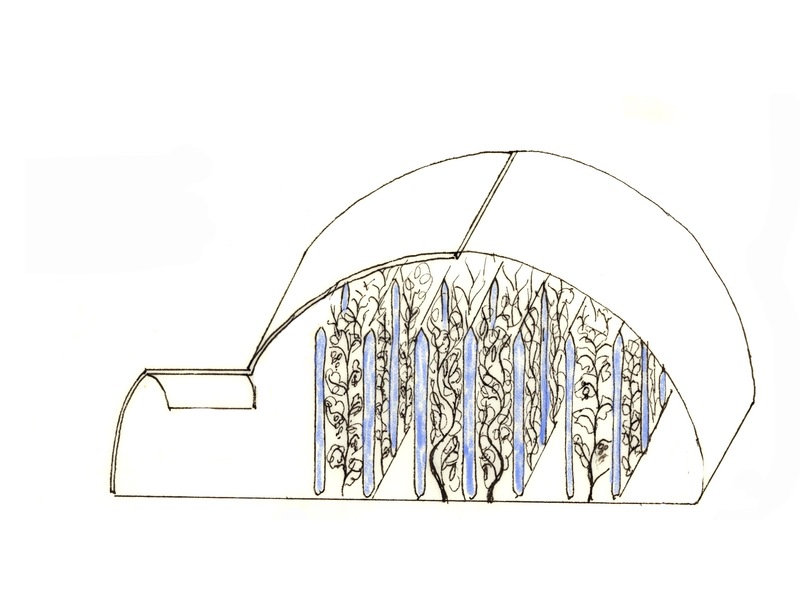 Bioshelters imagine a new synthesis between people and their local ecology: an early exploration in weaving together the sun, wind, biology and architecture on behalf of humanity. 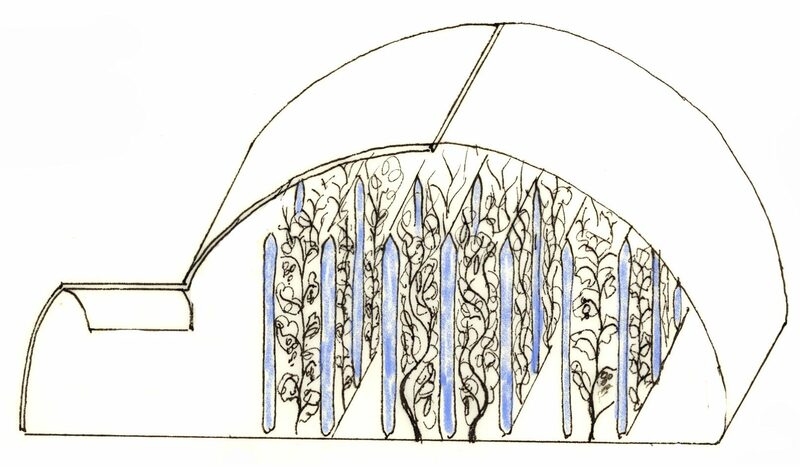 The architecture protects the ecosystem inside from extremes of wind and cold, and absorbs the energy from sunlight that causes plants to grow and heats the air. 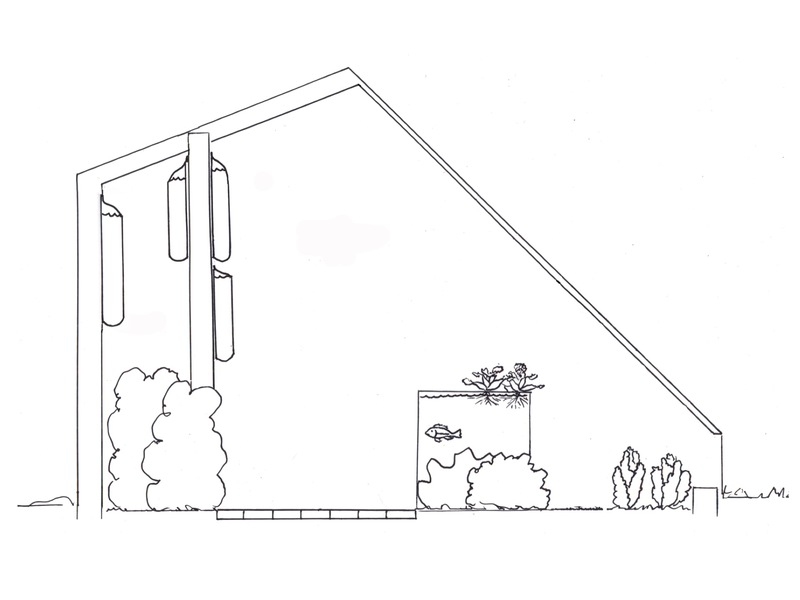 The ecosystem includes soil life, diverse plants, fish, insects, frogs, and people. Food is produced as nutrients cycle through plants and soil. 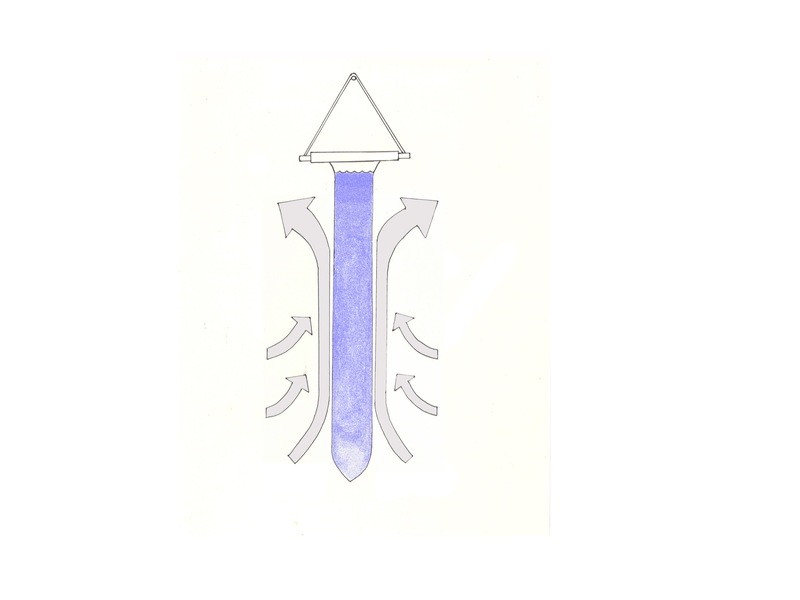 Water is captured, stored, warmed and directed to crops and ponds. 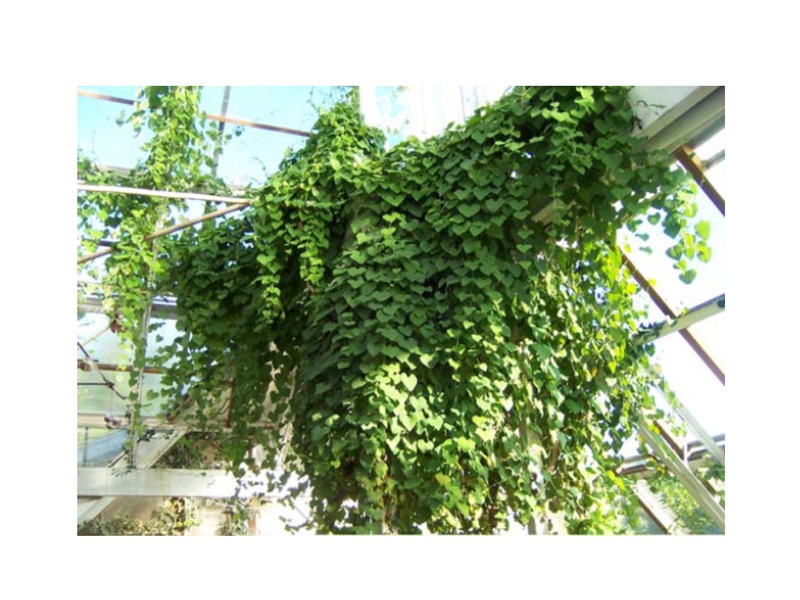 The air in a greenhouse on a sunny day will get hotter and hotter, and usually it is vented out of the greenhouse and wasted. 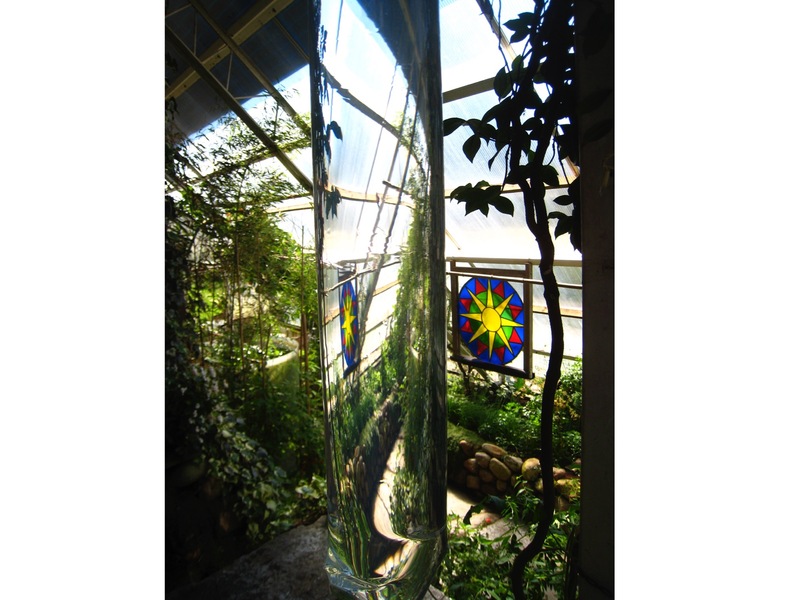 A transparent tube of water hanging in the greenhouse will absorb the heat from the hot air and store it as warm water. 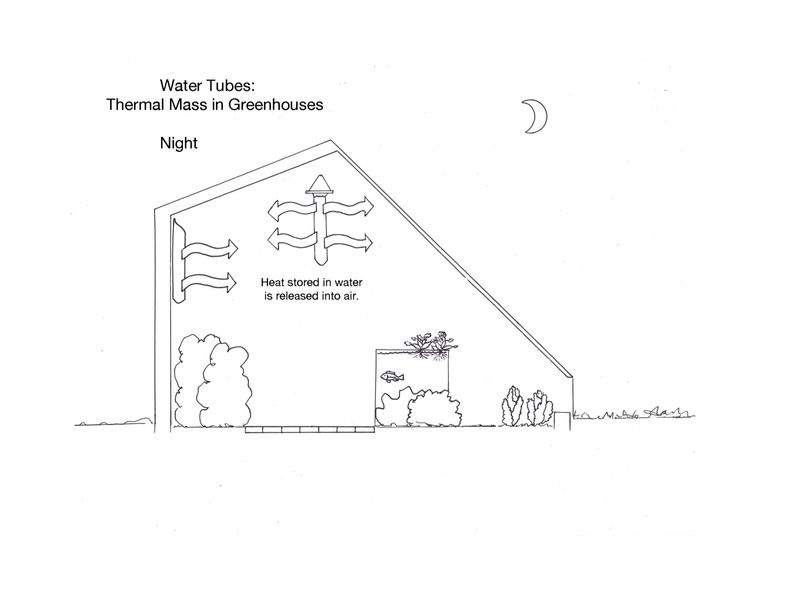 Later at night when the greenhouse cools, heat is released from the warm water and heats the greenhouse air. Water is the best material to store heat; it holds the most heat for its volume. 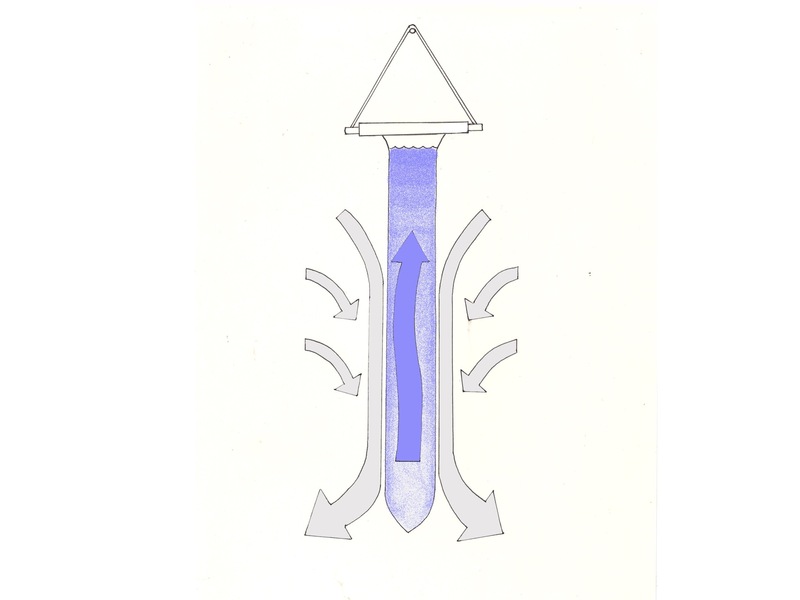 When warm moist air cools on a cold water tube, drops of condensation will form on the surface. 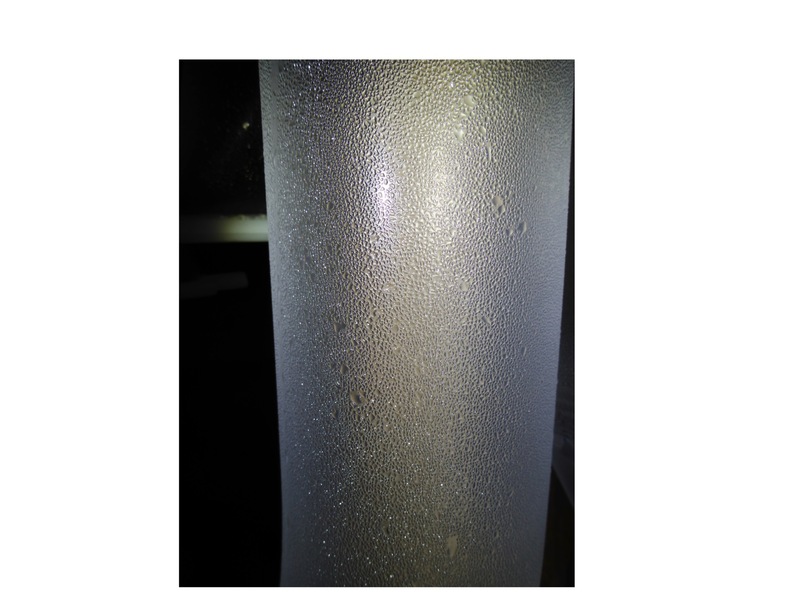 Condensation will be visible while absorbing heat. At night, it evaporates off and the tube is clear. 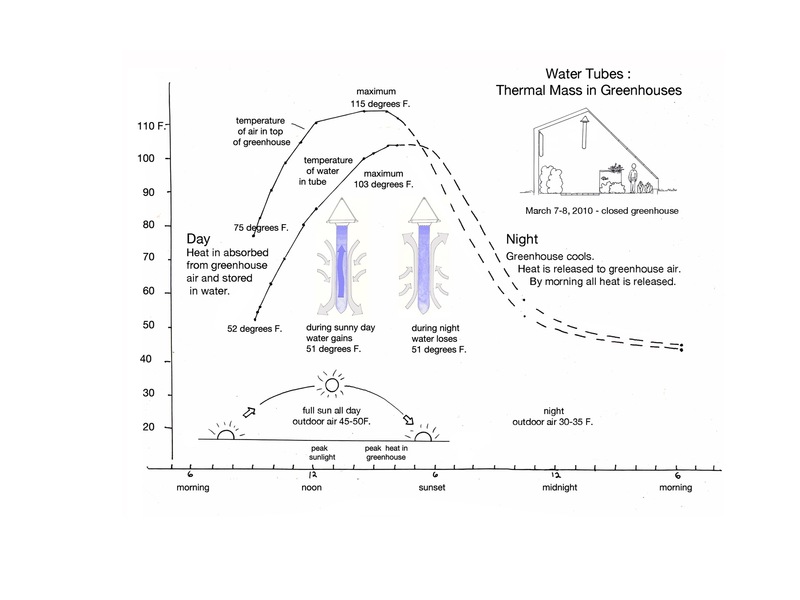 During the night, the now-warm tube radiates heat and the air touching tube becomes warm, rising upward. The water at the top of this tube is very warm; too warm to absorb heat and form condensation. 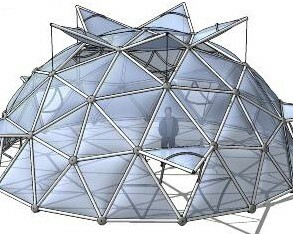 On a sunny day, hot air will rise to the top of a greenhouse. 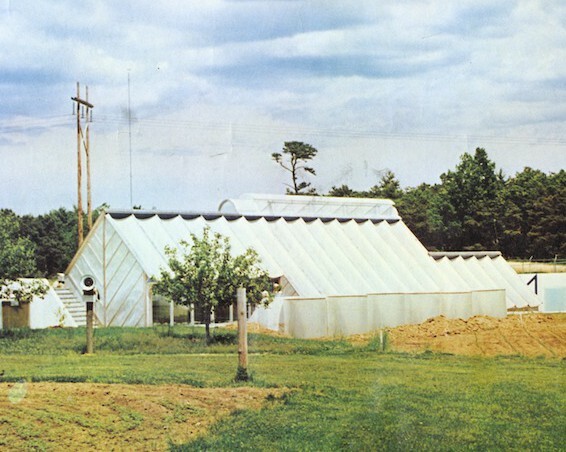 On this sunny day, the air at the peak of the greenhouse reached 115 degrees F. around 3 o’clock. Water tubes absorbed heat all day, starting at 52 degrees and ending at 103 degrees around 3 o’clock. 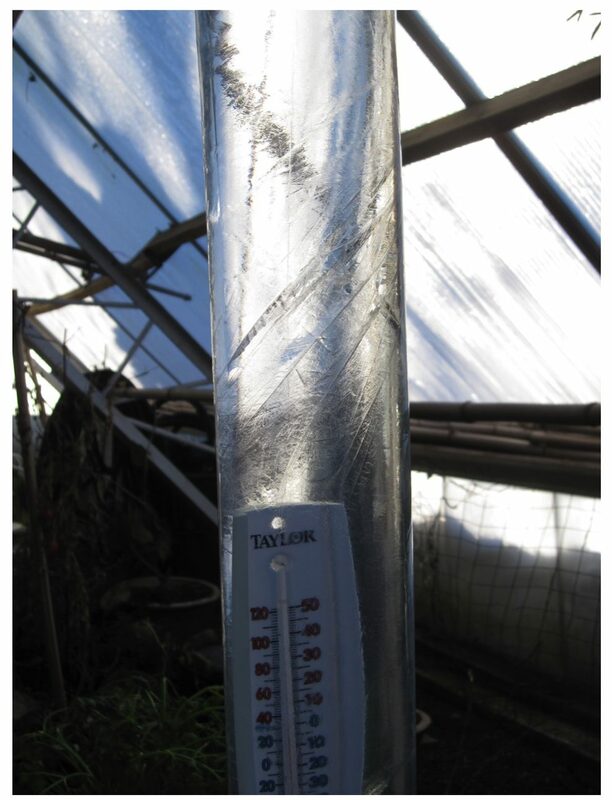 The sun went down, the greenhouse cooled overnight, and heat moved from the warm tube to the air. By morning, all the heat in the water was released back into the greenhouse air. 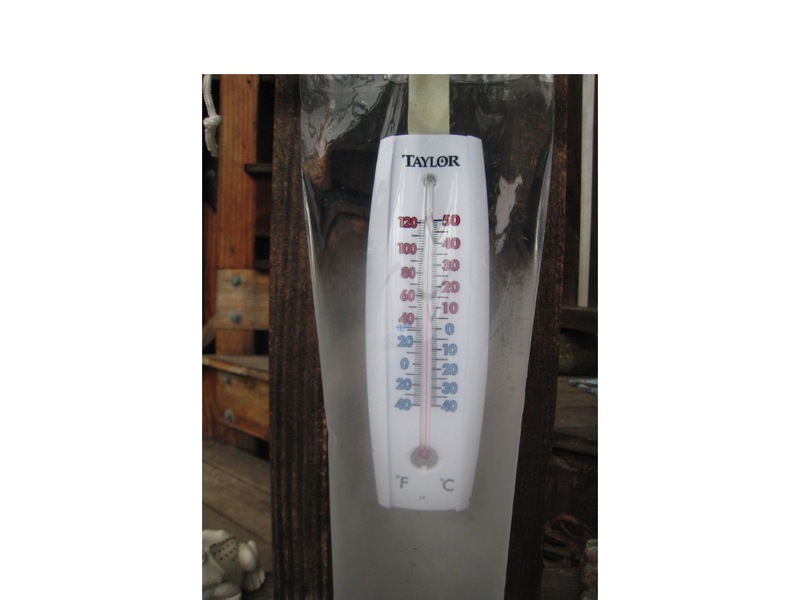 Thermometer in tube: water 100 degrees F.
When warm moist air cools on a cold water tube, drops of condensation will form on the surface. When absorbing heat, the condensation will stay visible. When heat is released at night, it evaporates off and the tube is clear. The water at the top of this tube is very warm and is not cooling any air. 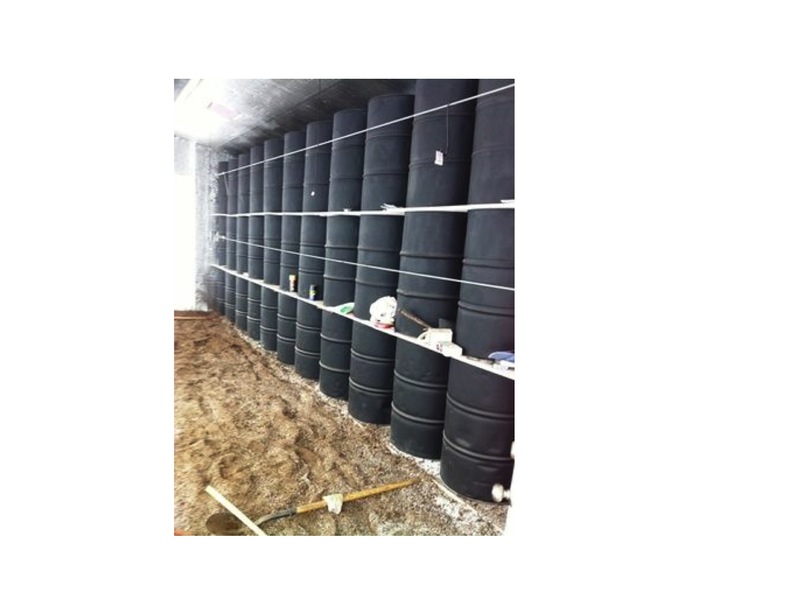 Using 2 polyethylene tubes 2″ and 4″ diameter, the water tubes will fail in a year or two. Using 2 Teflon tubes, they remained inert and clear and stable shape. 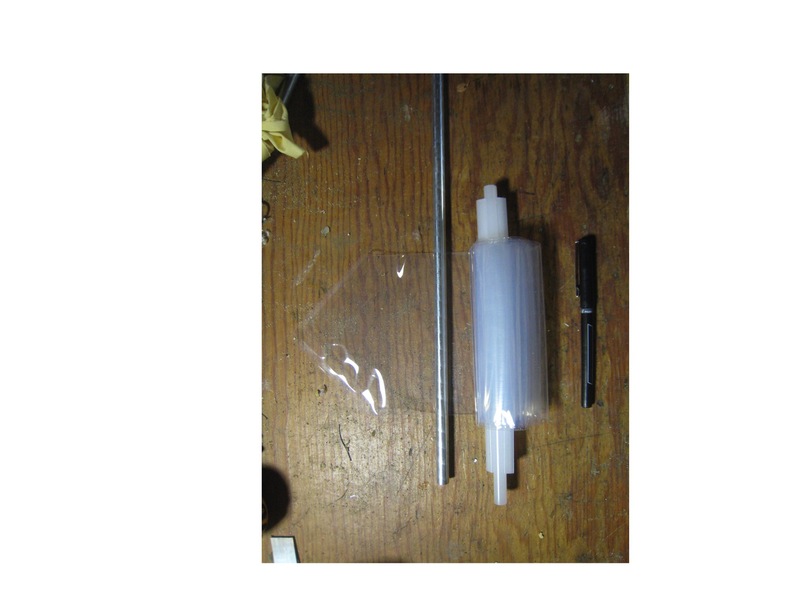 Using 2 nylon tubes, we had a catastrophic failure every 3 months with cloudy water and bulges in the bottom. Plastic rods bend and distort; so does wood; aluminum rods are better. We found that 4 inch diameter tubes are very heavy and hard to handle. 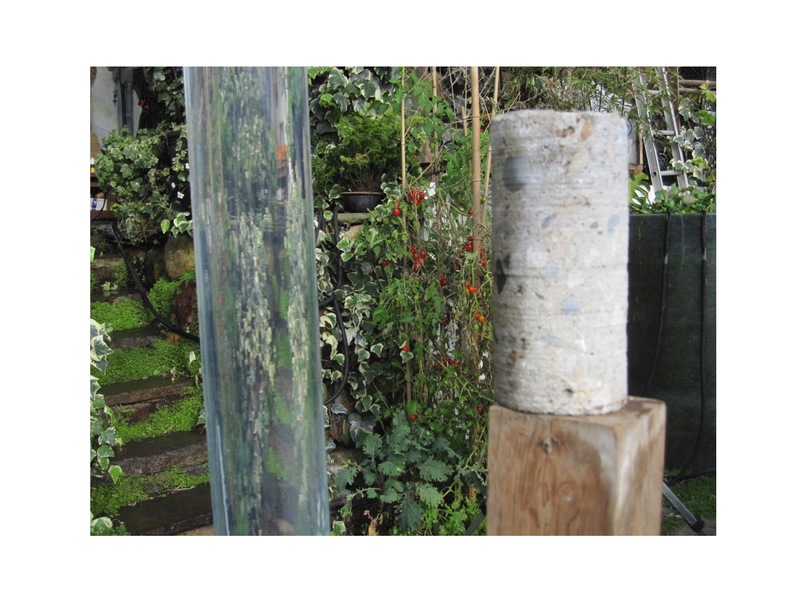 Hanging in freezing air, eventually the water in a tube will freeze. Water expands about 9% in volume when frozen. 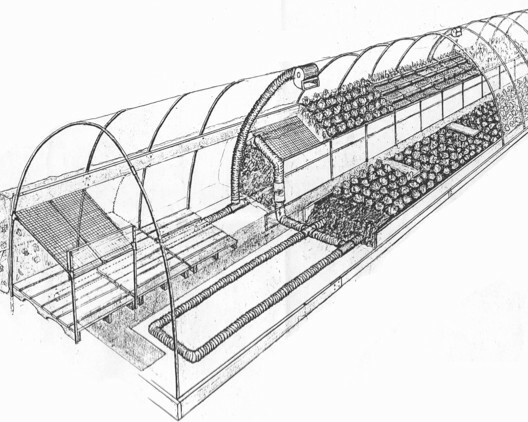 Water tubes are more effective if they are placed high in a greenhouse and distributed in many places. Plant leaves are 95% water; the water in leaves also store heat during the day and release it at night. 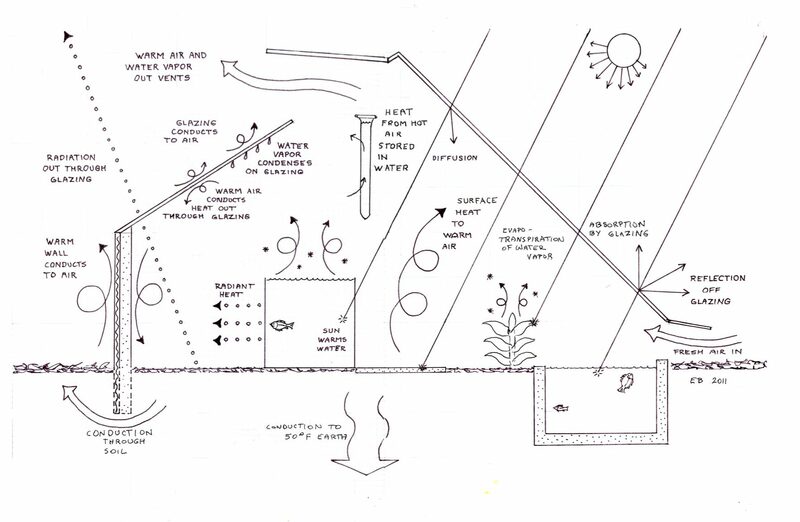 Solar fish ponds hold 700 gallons. 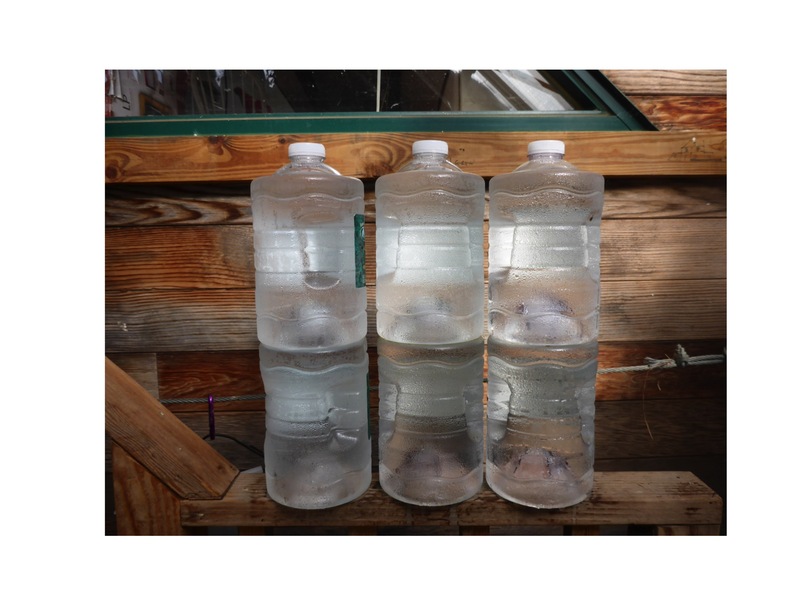 They warm up 5 degrees F on a sunny day, and can release heat for several sunless days while slowly cooling . Water stores twice as much heat as cement. Bottles of water work well, are cheap, and can last years. 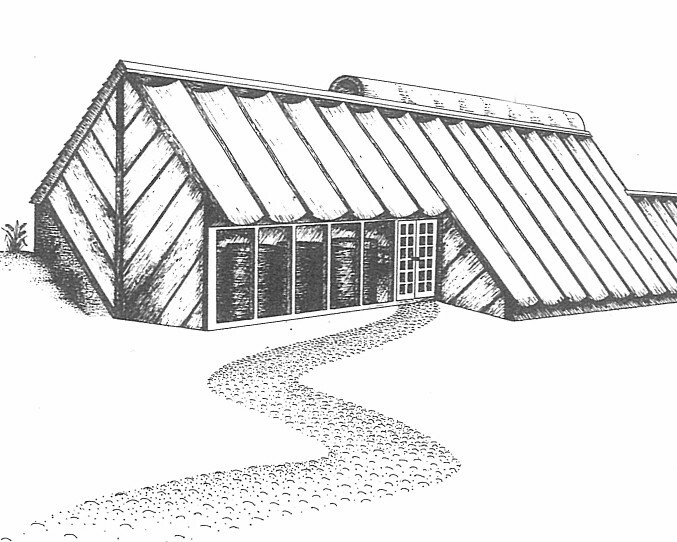 Plants in a greenhouse need the maximum amount of light possible to photosynthesize and grow. 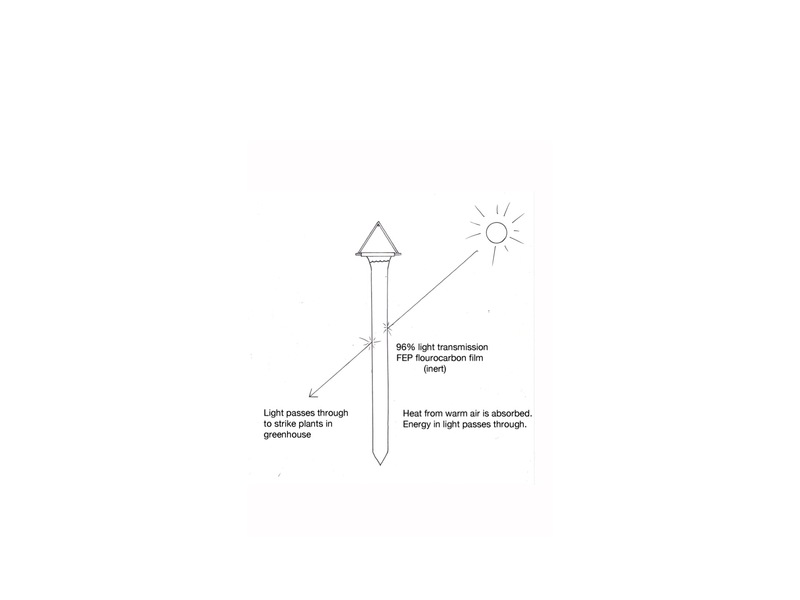 A clear tube in front of a plant will let light go through and hit the plant. 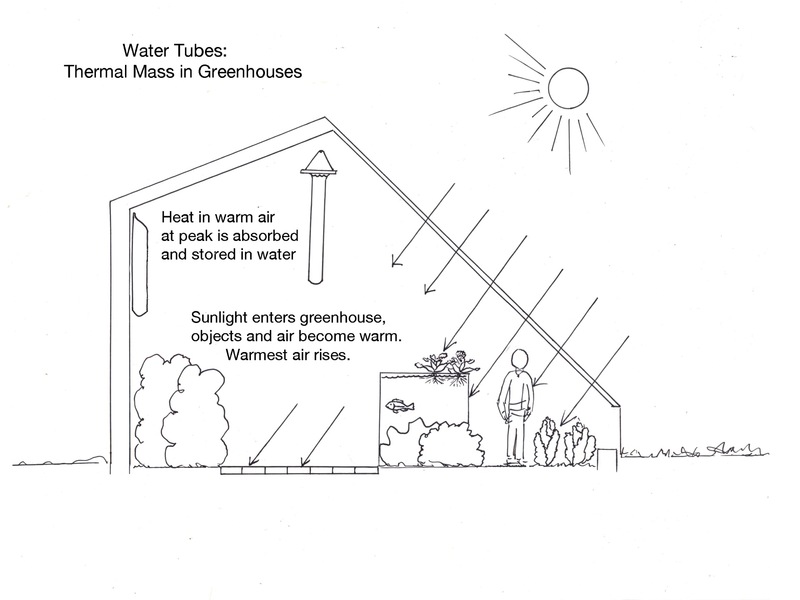 A clear tube will only only absorb heat from nearby air. 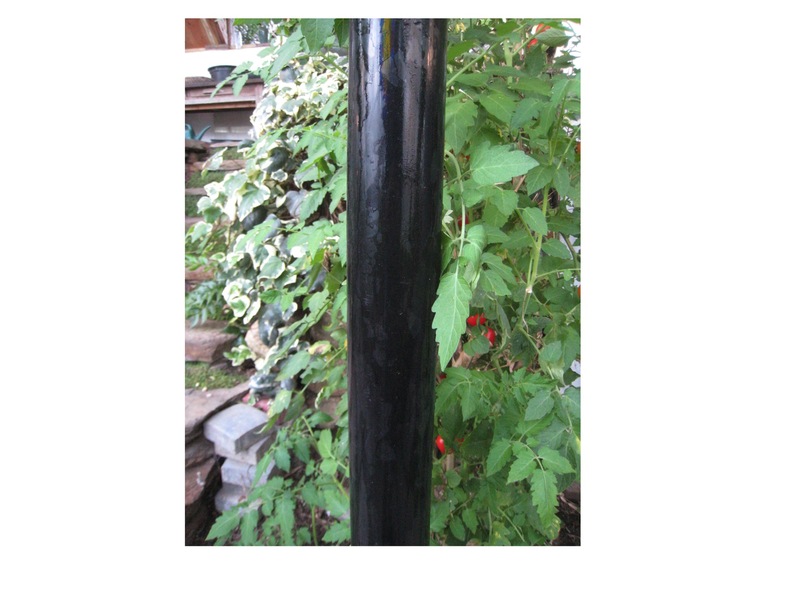 A black tube in front of a plant will absorb light, leaving less light will hit the plant. A black tube will absorb both heat from nearby air and light that strikes it, which turns into heat. A black tube will get hotter than a clear tube. 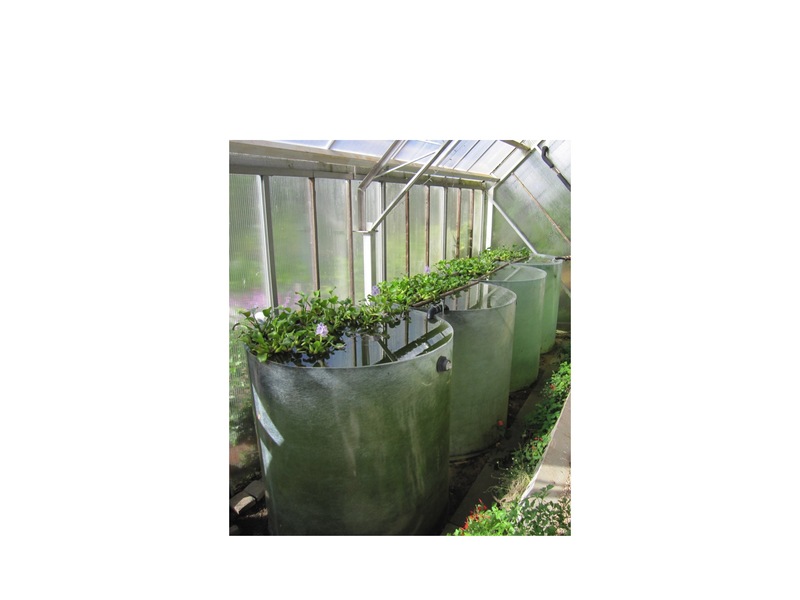 Black containers of water are useful to absorb light that will not strike a plant, such as at the north wall. On sunny days black metal drums of water can store large amounts of heat. Each drum weighs 400 pounds. Stacked drums are dangerously heavy if not secure. For people, black walls can be slightly depressing to look at and spend time near. 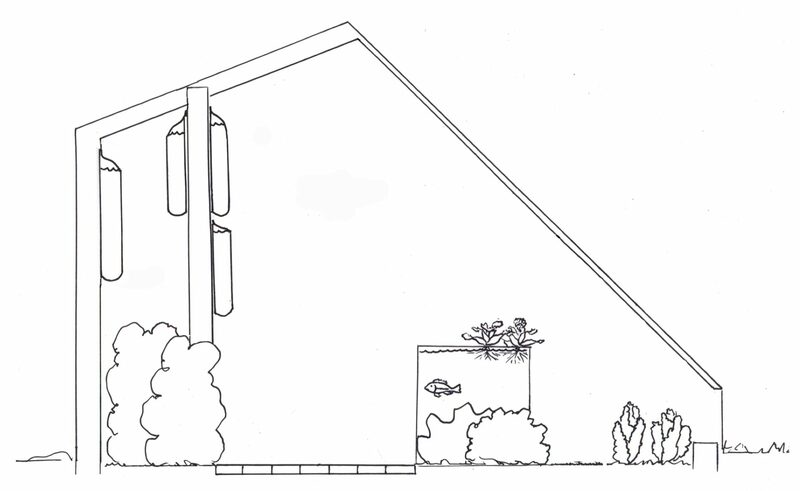 At this time, as far as we know, no one makes or sells hanging water tubes. We hope that someone sees this information and begins to make and sell them. We’re looking forward to the day when you can get them by Amazon. When that day comes, remember to order the ones made with clear fluorocarbon film.